JMB, I think that is what attracts people to personal blogs . . . the unpredictability of them, how the posts and words and photos are reflections of how the person’s life is progressing. What I am trying to say is that no apology is necessary. Peaks and valleys are life, are beautiful in themselves. Whatever you write, I enjoy. Your perspective broadens my own. I like Amaryllis’ … what’s the connection with the November birthday? 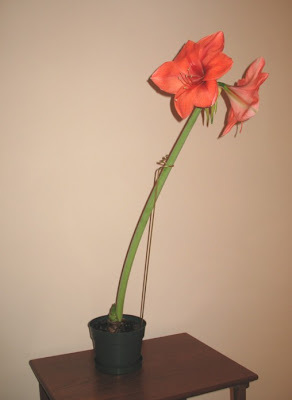 I’m terrible with plants … mine would be skinny and scrawny and probably not bloom! I am having exactly the same problem with a hyacinth I bought last week. It was a tiny thing and almost overnight became a top heavy giant pink blossom which refuses to stay up. I will have to find a stick to hold it up. JMB, you certainly have green fingers. And I agree with you about Ian’s excellent blog. I always learn something new over here. It is beautiful – I didn’t know they were so wilful, though! jmb, “more frivolous and less erudite” is okay by me! But it is NOT “less erudite” really! 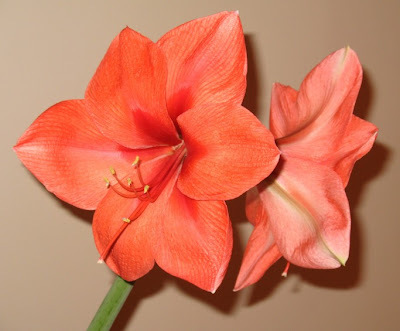 The photo of the Hippeastrum is beautiful! What a beautiful flower! But I like plants to have several flower-heads, and preferably attractive leaves, too. And they need to be able to look after themselves a bit at times. I probably won’t bother. Unfortunately, Amaryllis reminds me of the eighty LONG cantos I had to read at uni by Philp Sidney,Amaryllis and some Greek nymph or other who Amaryllis was in love with. A thinly veiled series of poems on his unrequited love for some young maiden who married Baron Rich instead. Moral of the story. I guess writing blogs when you’re feeling depressed is good. Eighty cantos of pure drivel that future generations might have to study, less so. I would imagine from what you say that Amaryllidaceae share a common ancestor in the late cretaceous, before Africa and South America broke apart. They would have spread north about three million years ago, when the americas met . What a beautiful flower. I never knew so much about them. I think Ian’s blog is fab too. Well you always find something here that reflects me in some way or another. Thanks for your kind words. I think they are weird, a beautiful flower on a tall stem. Sally but people always seem to be giving them to me. I emailed the photos to the giver however. I don’t put too much time and energy into them. Just pot them up and throw them out when the flower is gone. Bit of a waste really, but too much trouble to get to flower again. I came to check what this reminded you of, too funny really. I guess it’s warmer in your part of the world and you can keep them on. I’m amazed that you have some that have been going for so long. Thank you for your kind words. It seems that the bulbs arrive in the stores around early November, so it seems I am giving them for my November birthday. I think bloom is guaranteed with these things, the flower is in the bulb, you just have to water and wait. Well at least you hyacinth won’t be as tall as this giant thing. Plus this has no odour so the hyacinth has a plus there. No green fingers needed for this thing. Just water and wait as I said. I am still having trouble with that crazy BBC 4. But is it useful information, most of the time I doubt it. Very wilful, they are. They just won’t stand up straight! Well it’s often frivolous here and actually never erudite really. I was very pleased with the photo, just a little bit enhanced. The leaves come later and are not very attractive unfortunately. Very rarely they have two flower stems. Well I’ll give those 80 cantos a miss, since you don’t recommend them. But lots of blogs qualify for drivel too, sometimes this one I’m sure, often actually. They are both of the same family of course, but a different genus so what you say might be true. Of course the Hippeastrum has been much hybridized as well. More than you wanted to know I’m sure. Ian is indeed a treasure. Thanks to everyone for visiting and commenting. They do bring a lovely splash of colour though and there is something majetic about them, I think. They almost seem to defy nature. Now thaht confused me! Reading the comments and seeing another Liz. I looked at it and thougt,’ I’m sure that’s not what I wrote!’ But it is earlyish in the morning so it might have been. I will have to visit my namesake. You really have a skill for great pictures JMB. Hello, JMB, long time, no speak. So much is going on for me at the moment, some OK, some not so. However, I still manage to read all of my favourite blogs and have to say that whatever you write is fine by me. It’s all wonderfully readable, even the ‘frivolous ones. At present I have an amaryllis about the same height as yours with two flower stalks each heading in a different direction, so the turning of the pot ritual seems a bit pointless sometimes. I’ve now put it on the kitchen windowsill with one flower leaning against the wall and the other against the radio. Seems to work. Well it is pretty even if it does lean. And a little bloom in the winter is uplifting.